"Excellent purchase (VOLT™ Metro) - impressed with the quality of the components and the purchase process. Only slight problem was that it didn't come with a manual but excellent response from the Customer Services team who emailed a pdf copy straight away. Bought on the recommendation of my brother who has a similar bike and it seem that VOLT™ have put some small incremental improvements onto my bike eg properly waterproofed cable connectors and stainless bolts etc"
"I ordered my VOLT™ Metro ebike direct from VOLT™ as there was'nt any shops that stocked them near to where i live, i did have to wait several weeks for it as it was out of stock but when it arrived to my home i was very pleased with it, i think it is a cracking bike and can't fault it at all." 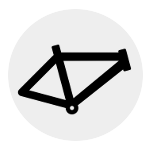 "Purchased the VOLT™ Metro bike from "The Bike Shop" in Arnold, Nottingham. Have had the bike for the past 3 months and have been very pleased with its performance. It looks as is very sturdy and looks as though quality parts have been used. The bike is easy to fold-up and although a little heavy to lift with the battery on it is still manageable. I bought the VOLT™ after reading reviews and also a electric fold-up cycle was required to fit in a small space in our camper van. Overall I am happy with the purchase. I was very pleased with the staff at the Arnold bike shop as they spent time advising as to the working/instructions of the VOLT™ Metro. A free check-up/service after 6 weeks. Only one small "niggle" is that a strap or other securing method should be included as when the bike is folded, (very easy) you need 2 hands to pick it up and keep it from trying to open. I have resorted to using a "bungy" cord to stop it from opening"
"I bought a Metro folding bike and well pleased with the excellent build quality and nice looking modern lines.Bike came with extremely comfortable saddle and decent lights,which is not applicable to other makes.Easy to operate and does pretty well the mileage as described.But the only let down is a minor point---the manual describes mode display with different symbols.Not a big deal as you can work out the relevant mode displayed.Nice and comfortable bike to ride and was worth the money as it seems to be an excellent product.I would , and have recommended it to other people." 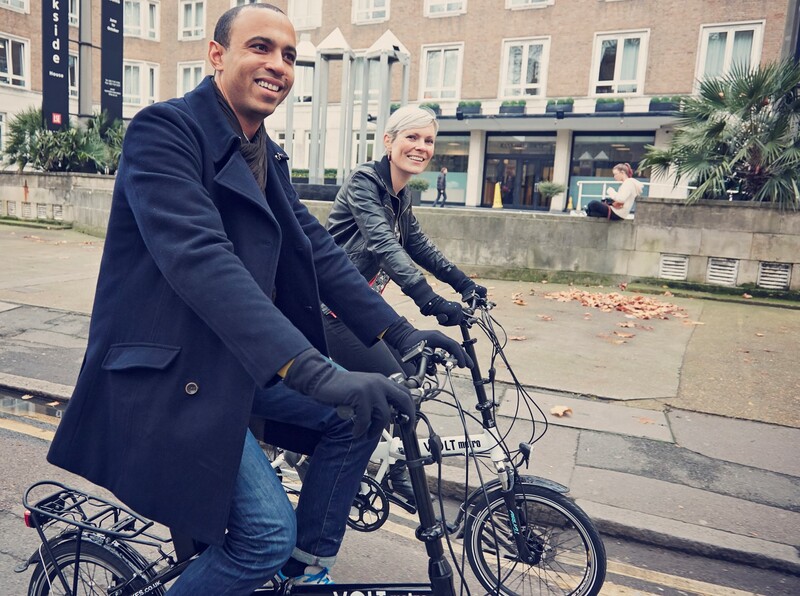 "We would definitely recommend the folding e bikes. Since buying them we have enjoyed finding new places to cycle and having the assistance of the motor has been great. They are easy to fold and store in the car. Just needs a little practice getting used to right power level and gears but that doesn't take long. Looking forwad to taking them to France." 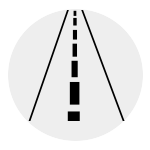 "Very good, friendly company with which to deal. My only suggestion is that the Metro fold up bike has bigger gears, as when I'm using assistance level 4, the top gear doesn't take me much past the assistance level. I can only do about 17/18 mph on the level. A bigger gear would be an improvement. People on ordinary bike go past me. The bike itself is very sturdy and well made, perhaps a little too heavy (48 pounds) It should be possible to make it lighter with modern engineering technology. I'm glad I bought it though. It brings a smile to your face, when the motor kicks in and it should last for years." 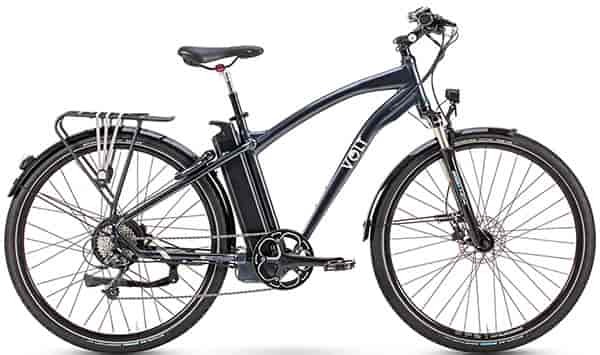 "I have been had an electric cycle for the past 15 years but it was time that it needed replacing.I purchased my VOLT™ Metro in June 2016 after extensive research into modern e-bikes. Having suspension on the front forks and seat post ensures a comfortable ride. The bike does not rattle over bumps. Good to see the speedo is in MPH and can be programmed to KPH too. 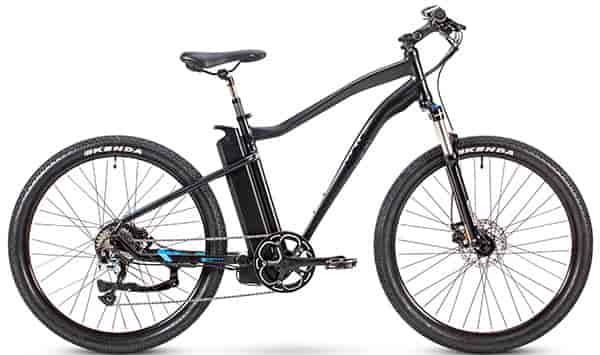 I am very pleased with my purchase and recommend anybody looking for a folding electric bike needs look no further." I can recommend the bike very highly. "I bought my VOLT™ Metro to allow me to put the bike in the boot of my Nissan Micra. This allows me have away days in the surrounding countryside with my friend. I live in the Scottish Borders where the landscape is undulating to say the least! The bike has coped with every hill I've gone up. I find I only use level one or two on the motor as I still want to do all of the flat work and some small gradients. When it gets a bit more difficult then the motor gives me a helping hand just like a wee push from behind. Great! My longest trip so far has been over 36miles which is about the limit of recent previous trips on a pedal only bike. I used to cycle much longer distances but those days are now I distant memory. I'm still trying to gauge the amount of battery I use, taking into consideration the terrain, power level input (electric and leg), use of gears and distance travelled. All in all this bike does all that want from it. 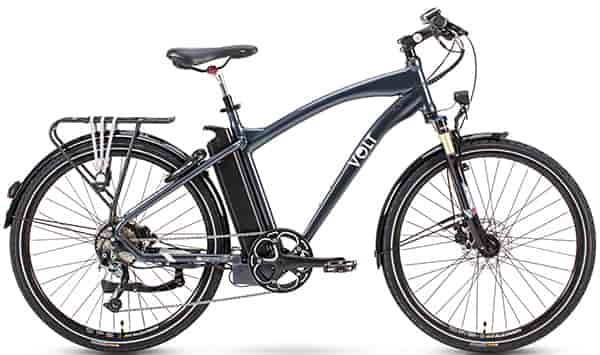 I bought my bike from my local dealer who I have known for several years therefore I cannot make any personal judgment about VOLT™ as a company. I trust my dealer's relationship with the company." 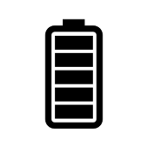 "Bought two VOLT™ Metro bicycles with the larger batteries! A Metro LS for my wife and a Metro for me! If you are looking for a fantastic form of transport then I would recommend the Volt. I use mine everyday for a 25 mile round trip commute over very hilly terrain. I cannot recommend this bike enough. Fantastic build quality, very quiet motor and great fun to ride! No longer do hills fill me with dread, can wear work clothes as you no longer sweat your cobbs of cycling! To say I love it is an under statement. Charging process takes about four hours use about a third of the battery on my commute! Bought them from Velo Smith in Plymouth who arranged a test ride! VOLT™ after sales is very good. My wife and I are in our fifties and often go for long rides together. 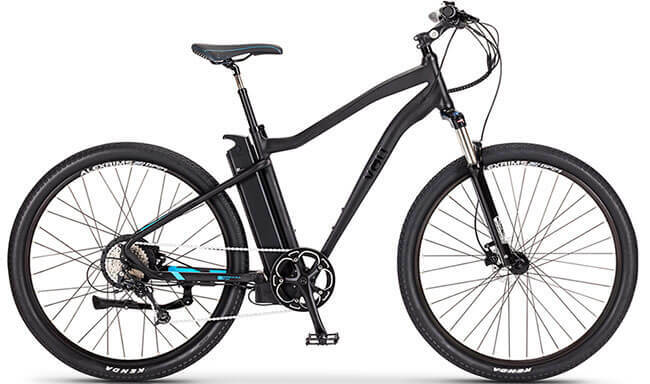 Get a VOLT™ Ebike hit the trail and never look back, recommended!" 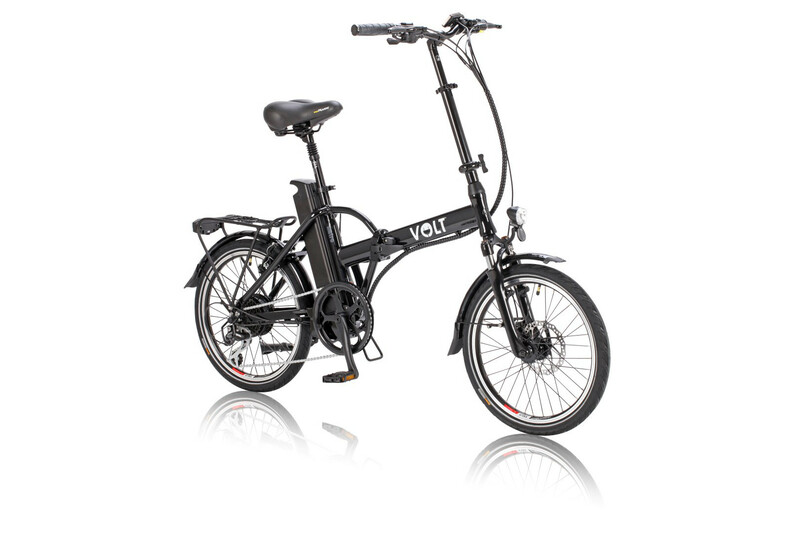 "We purchased two VOLT™ Metro Folding Bikes, having had ordinary folding bike previously we found the VOLT™ bikes very stable and pleasant to ride having a longer wheelbase. 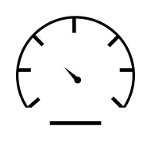 The gearing is a little low as we have them in top gear most of the time but realise it has to be at a ratio suitable for hill climbing. They are heavy even without the battery but when you look at the build quality and the power the frame and wheels have to take it is understandable. 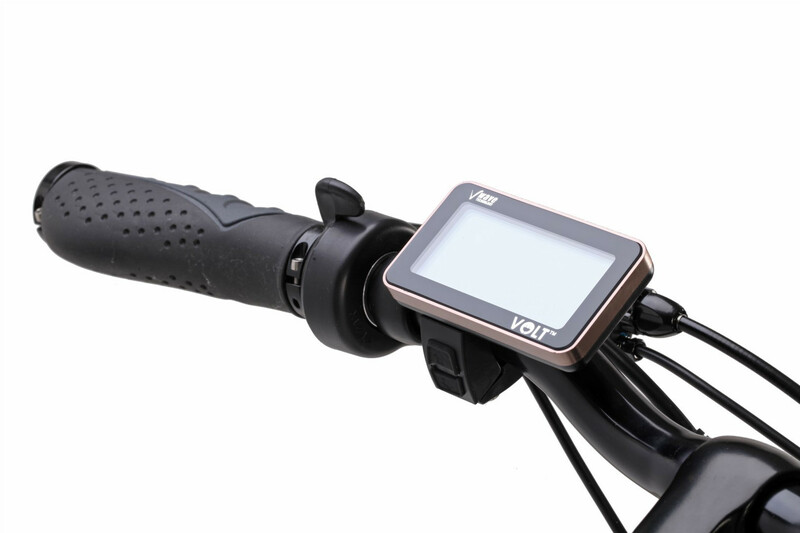 I would recommend the larger battery and are so pleased we purchased them when ordering the bikes. We would recommend the VOLT™ Metro over many others I tried when deciding to purchase." "Amazing experience and super service and support from the agent Perth City Cycles who enabled me to try before I bought. Minor gripe is that the handbook is poor. Why write this things in China and omit a diagram showing how to charge the bike?" "I bought this bike because I had to give up driving because of a visual impairment. I live part of the time in an isolated hamlet on a hill and as I'm 64 felt that an electric bike was the solution to my transport problem as the nearest railway station or bus stop is more than 2 miles away. This bike more than exceeds my expectations; I can ride up the hill with ease even with fully loaded panniers. It folds easily and I have taken it on trains and busses. It is quite heavy which is to be expected for a bike of this type. The after sales service was excellent This bike has given me a new sense of freedom and I highly recommend it." 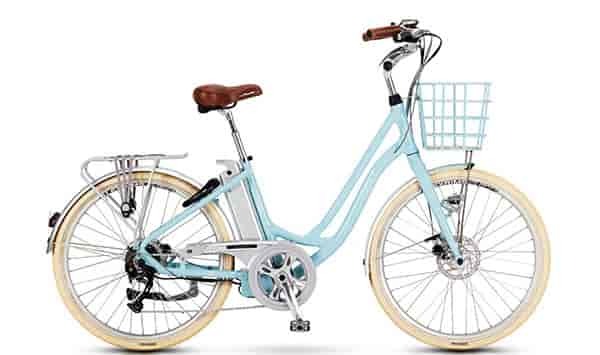 "I'm just so pleased with my low rise folding VOLT™ metro bike,being short it is such a fantastic design,it performs so well up hills,I would recommend this bike to any woman who wishes to exercise more with a bit of help. "I have my metro about two years now, my daughter knocked it over and snapped the little mount that holds the front light. I couldn't find the mount anywhere online. I emailed VOLT™ to point me in the right direction as to where I could buy a new one. They phoned me the next day and sent me a new one completely free. 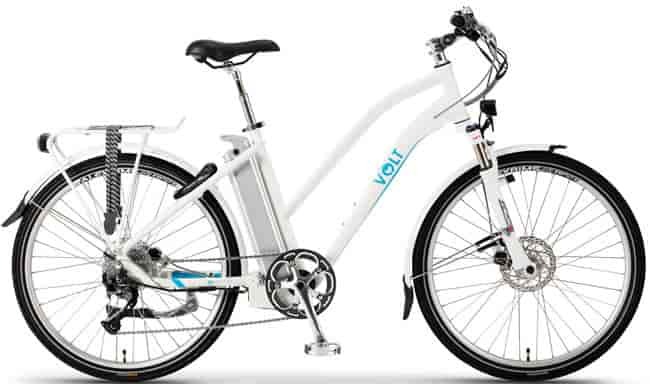 Fantastic customer service..."
"I bought two VOLT™ Metro bikes recently and have been very pleased with them. I bought them through a cycle shop so didn't have to do any assembly, the shop did all the PDI checks before handover. Very pleased with the features on the bikes and with the build quality. 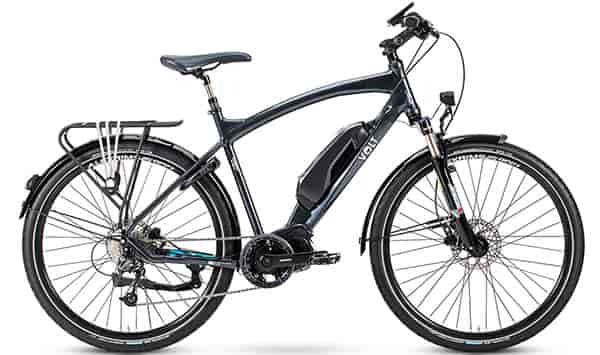 Suggestion: Have a facility to measure in miles instead of (or as well as) kilometres"
"Had my VOLT™ metro bike for a 6 month. Use it every day :) Already done 3000 km!!! Many thanks for your friendly customer service. :)"
Best buy of my life- adore it. 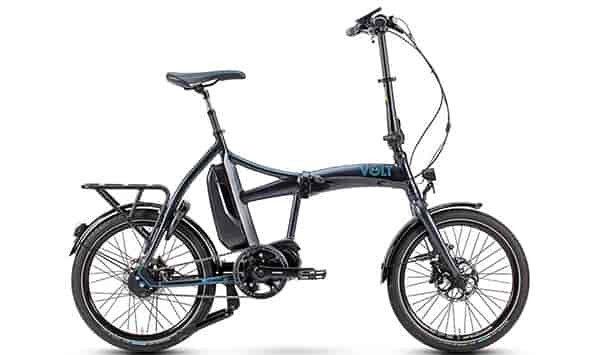 "I bought a VOLT™ Metro electric folding bike in July 2013 and have used it in both the open countryside and in the thick of city traffic and it is perfect for both situations. 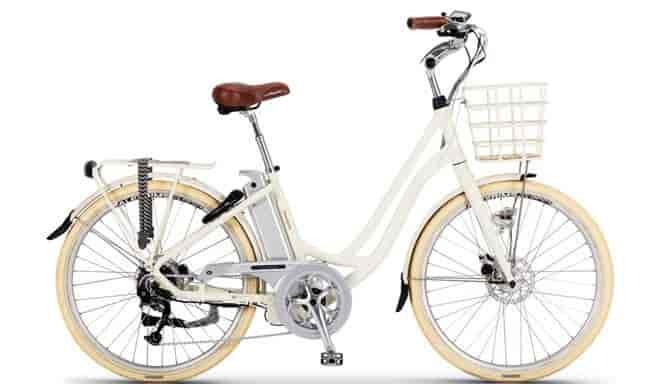 It is comfortable, speedy (thanks to the 5 power settings and great gears) smart looking, suberb disc brakes, and very easy to cycle without using the battery assistence. 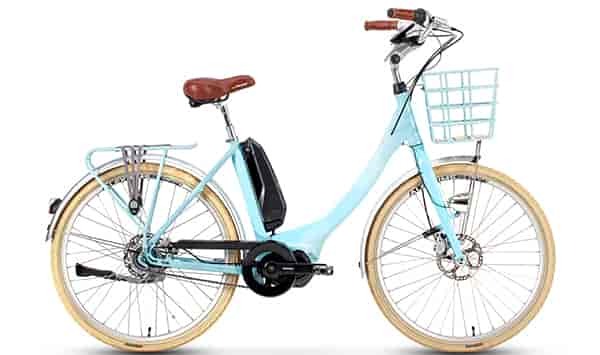 I never thought I could find an electric bike that was as agile and nifty as my normal city bike. It is a joy to ride. It has only one negative point and that is its folding position. It folds easily but it has nothing to clip it shut and no way to free stand it and it tends to rest on the plastic chain guard which risks being cracked. It also does not come with a travel bag that you can store it in when floded and travelling. This is its only weakness. 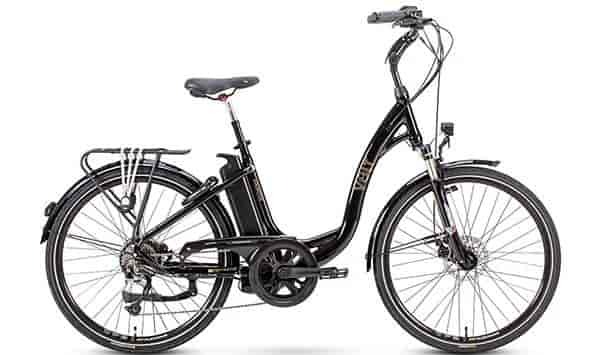 I want to buy another electric bike for my holiday house but I am finding it difficult to find one that matches the VOLT™ Metro...but I can't afford a second VOLT™ Metro! The thing that sets this bike apart is the different power settings and the throttle. very few bikes have such a wide range and when you cycle 10-15 miles you need them all by the end of the journey!!" 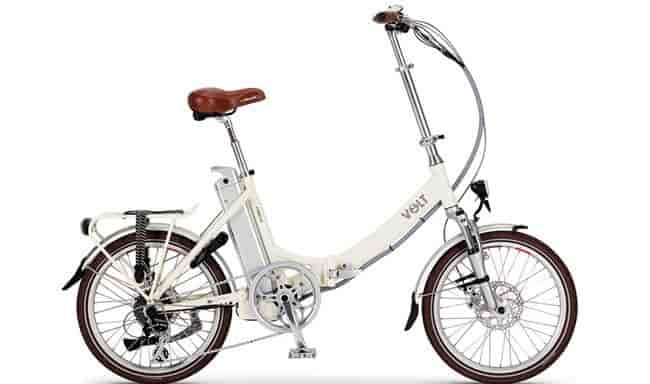 "Have the VOLT™ Metro folding bike, it's a great bike around town, passing other cyclists up hills is quite funny with 250 watt motor helping. 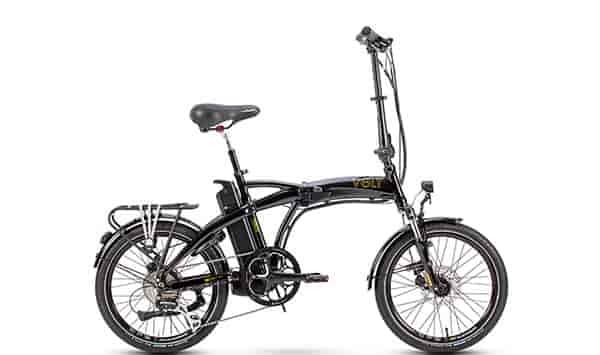 It's the only folding bike I could find with a electric motor, disc brake, front suspension and a really great seat with suspension also. Folds away really nicely, but it's really heavy to carry up stairs due to the weight of the battery. Also a great company with great service. They answer all your problems and concerns." Puts a smile on your face ! "I was going to buy a VOLT™ Metro for my wife, who finds it difficult to keep up with me on road trips out on our mountain bikes. I arranged a test ride at the local dealers and it instantly put a smile on my face , so I decided to buy myself one as well !! 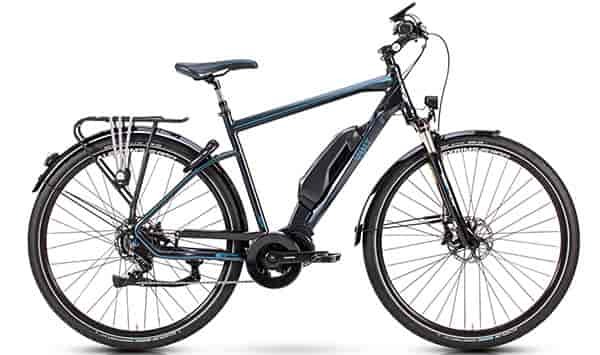 The bikes are quality built, and a pleasure to ride, whilst easy to fold up and stow ( albeit a little on the heavy side compared with a standard bike due to the battery). First trip out we tentatively decided on a ride around the northern half of Windermere planning to return to Bowness on the ferry - a journey of around 15 miles. We enjoyed the bikes so much and didn't feel we'd put in any real effort ( because the pedal assist is really just like an extra set of gears) , that we decided to do the full circuit , clocking up 33 miles! It felt like a real achievement and whilst these are folding bikes with 20in wheels they coped on the lanes and by-roads without issue. As the days are now shortening I'm using mine for the occasional daily commute to work benefiting from the handy carrier / rack and lights which come as standard. Only issue so far has been a faulty pedal which was replaced with a better quality pair without question. I'm becoming quite an evangelist for these little bikes and can't recommend them highly enough. Just bear in mind that if you are thinking of buying an electric bike and surfing the net for the best deal as we all do, that this is a British company with an increasing string of dealers who go out of their way to address any issues or queries - you may not find that if the one that's made in China you bought off the 'net goes down. So well worth the premium price tag in my view.)" Awesome product, awesome service, thanks Electric bike store. "Amazing effortless cycling, ideal for commuting to work. I cycle 3.5 miles I arrive fresh and not a bit tired, then after a 12 hour shift, I'm usually knackered, I ride home the 3.5 miles effortlessly. Awesome product, I charge up every 2 days to maintain optimum performance. Awesome service from Electric bike store. 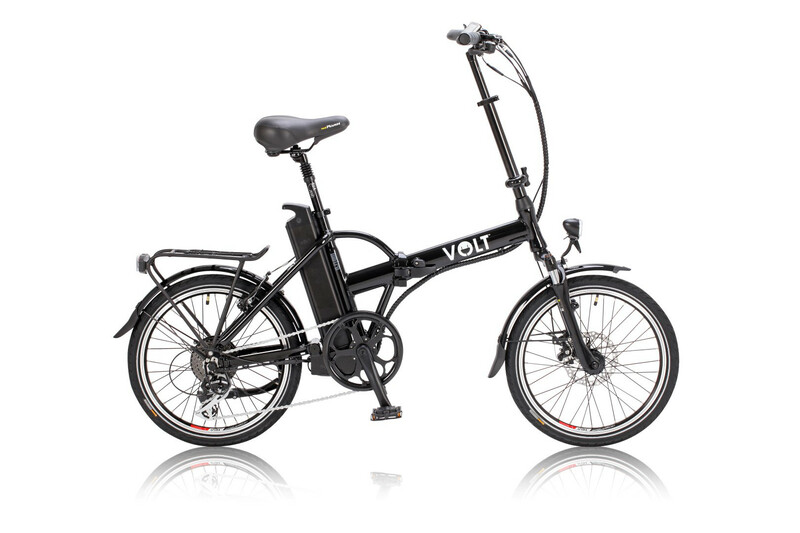 The VOLT™ company provided good service and advice before and after the electric metro bikes had been purchased. "Good company and provided all the required information prior to the sale." 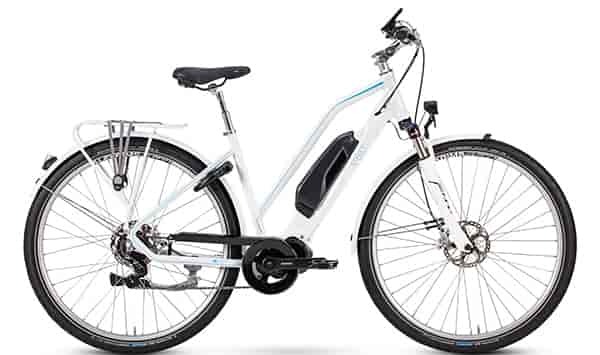 "I have been looking for a folding electric bike for ages and was struggling to make a decision. 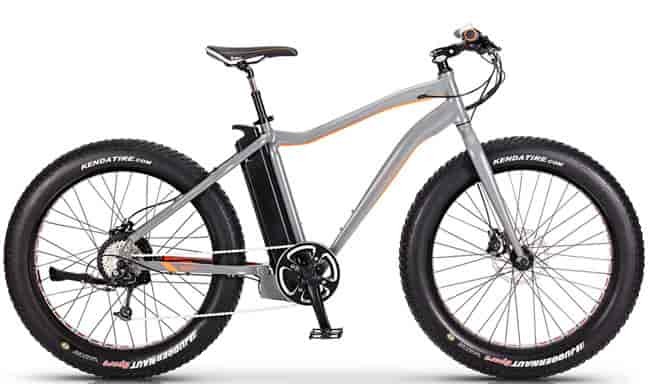 I was lucky enough to come across electric-bike-store.co.uk from searching online. I found the website very informative and really liked the look of the VOLT™ Metro. I called up the shop and spoke to one of the staff who was extremely helpful in answering all my questions and I went ahead and purchased two Metros, one for myself and one for my wife. 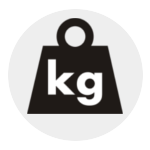 Overall it was a very pleasant shopping experience and I'm very happy with my decision." Love my new folding electric bike! "Recently bought a VOLT™ Metro. So far I've used it everyday to commute to work. This is the best purchase I've made in a long time. Thank you very much electric bike store. Great service! "